I’m a Director, Writer, Producer and Fencer. Growing up in the competitive world of fencing taught me the discipline and skills that have helped me stay focused and driven. I draw upon my personal experiences and constantly try to develop and grow my directing career by telling my own stories. When did you fall in love with the art of “storytelling” (your defining moment)? To make a long story short my parents almost named me Zuzu after Jimmy Stewart’s daughter in the movie “It’s a Wonderful Life.” Instead, they ended up naming me Karolyn after my dad, Karol. When I was a kid my dad and I were buying a “Bedford Falls” sign from the movie on “Ebay.” We called the person who was selling this piece to give them our information. Who picked up the phone, no other than Karolyn Grimes (Zuzu from the movie). Karolyn spelled with a “K” like my name! She invited us up to Seneca Falls, New York, where she was doing a promotion for the film. I got to meet Karolyn Grimes and got to sit next to her at a screening of the film. She would lean over and tell me all of her experiences filming the movie with Jimmy Stewart. I remember her telling me that there were bubbles in the water when Jimmy Stewart jumped in because the snow falling down was actually made of soap. I was fascinated hearing about what went into making movie magic! Her stories fascinated me. I knew that night that I wanted to work in the film industry and tell my own stories. Tell us about your “PSA”, commercial “Speak Up When You’re Down”. Is the creative process for commercials different than let’s say a film or TV show? Although a commercial is a lot shorter than a film or a TV show, you still have to create a script and tell a story in 30 seconds. In some ways it can be more challenging because every second counts. When directing a commercial, I am trying to picture how the spot will edit together in post. For example, if you want to show someone picking up a glass of water and taking a sip, they can’t take ten seconds to do the action or that’s a third of the commercial. If I want the actress to take her time picking up that glass of water, I have to visualize what would look good to cut in between the moment of her picking up the glass and taking a sip. Usually commercials are snappy and have quick edits. A good commercial director understands all stages of production, especially editing. You attended college at Northwestern University where you learned the foundations of your directing skills from working alongside director Garry Marshall, how did that professional connection come about? Well, I studied filmmaking at Northwestern University and although Garry Marshall was a Northwestern Alumni that is not where I first met him. Garry was directing the musical “Happy Days” in New Jersey and would frequent my uncles’ restaurant. Garry had a contagious way of making friends with just about anyone. At a “Happy Days” wrap party he met a lot of members of my family. (I’m half Greek… if that helps paint a picture lol). After meeting my family he heard all about me from a dozen or so people and let me come to Los Angeles to interview with him. That summer I became his intern and then after I graduated I became one of his assistants. Garry was my first boss and role model that I’ve constantly looked up to. He was a person you always wanted to work very hard for. From him, I learned that being a director of a film you not only want to know how to direct the camera and the actors but you also want to create a warm environment on set. If the crew is feeling good then everyone will want to be there and work hard for you. Positive vibes go a long way to make a successful movie. And what advice would you give to someone who is interested in directing but doesn’t have a mentor to learn from? Find someone who you admire and ask them out for coffee! Rarely do people say no if you approach them in a way that’s not asking for anything except advice. (People love to talk about themselves!) I still ask people to get coffee with me. Hearing about other people’s experiences gets me inspired and excited to start working on something right away. Then afterwards, follow up with that person and tell them what you accomplished since meeting with them. *Boom,* you have a mentor! Specifically for directing, the best thing you can do is pick up a camera or an iPhone and start filming. Keep trying things out and learn from your own mistakes. Also, ‘Women in Film’ has a great mentorship program! That’s the golden question. It’s really hard to become a working director… let alone a working female director. Even though I’ve directed a TV show that is now on Broadcast TV and on Netflix, I still have to constantly prove myself to keep working. I’ve been able to sustain my career by freelance producing and making other people’s projects come to life. Producing is a great skill and you meet many people in different avenues of production. My producing work has made it easier for me to get my own projects made, and has gotten me into the Producer’s Guild of America. Everything – I’m not kidding! Producing is keeping tabs on every stage of production. The first thing I do when I get a script is I do a breakdown. You need to know all the elements of every scene. (Location, actors, special effects, props, costumes, etc.). Then you need to figure out how to make it all happen. The next step is to create a budget based off your breakdown. How many shoot days will it take? What are your restrictions? A producer has to then communicate with all the departments to figure out what everyone’s needs are. Based on the project restraints, you need to be realistic with what is possible or not and communicate that with department heads. It’s the Producer’s job to make sure all the pieces of production keep moving, delegate tasks, and often wear many other hats to make sure things are handled. It’s definitely a job that requires you to be organized and to be able to prioritize. I have a notebook that I always have with me. When I wake up I look at my to-do-list that I made the night before and I start to prioritize what I should tackle first. When I am directing a project I am still always wearing my producing hat as well. A Director/Producer has to be a delegator but constantly has to keep tabs on all aspects of production in order to make sure it gets done the way you like. On pre-production days I am usually on the phone or emailing people following up on progress. On a production day I get to set early to walk around the location or sound stage and visualize where my setups are going to be. When production heads start to arrive I check in with everyone and make sure everything is communicated. First I check in with my Director of Photography and go over our shot list order and setups to make sure we are on the same page. Next I check in with Makeup, Wardrobe, Production Design, etc. When my actors get to set I let them settle in and brief them on what we are doing. Just before the first shot of the day I like to have an all cast and crew team quick meeting. Usually we will have a few important announcements but mostly it’s to provide words of encouragement and gratitude to get everyone pumped to start the day. This starts the day on a positive note. On set we will usually rehearse a few times with the camera and while we are waiting (most of the rehearsing goes on before the production day). After we wrap for the day I usually like to chat with crew heads again to touch base about the next day. What one piece of advice do you have for women looking to get started in the industry? Believe in yourself! You will find out that no one is going to believe in you as much as you believe in yourself. Keep fighting for yourself everyday with persistence. When you find those people who want to work hard for you and believe in you as a leader, keep them close and always invite them back to your team. I have a few of my own projects in various stages of production and some scripts I hope to make into feature films. 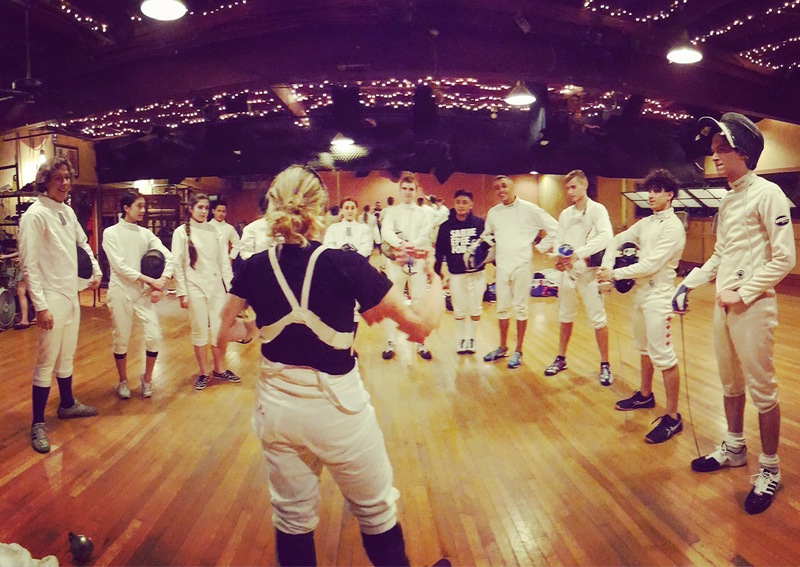 Recently I directed a proof of concept short film “En Garde!” The feature film is the first-ever teen fencing movie, based on my experiences growing up as a competitive fencer. I hope to show people this unique untapped world of high school fencing, seen through the eyes of a passionate high school girl. The project was featured on IndieWire (link below). My next step is to direct the feature film and to find the right team of people who will invest in the project. Posted in Behind the Scene and tagged creatives, director, producer, screenwriter, script, short film, women in film. Bookmark the permalink.